Hello and welcome to The Peachy Keen Stamps Spring Fling Blog Hop!! You should have arrived here from the very sweet and talented Raven Baca's Blog, but in case you just happened upon this post, then you're going to definitely want to go back to the beginning so that you don't miss one single crafty and inspiring creation! 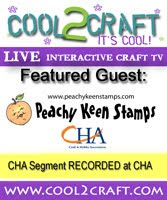 It all begins on The Peachy Keen Stamps Blog, HERE. Here's the card I created for this Spring themed hop! For this one, I used the PKSC-16 April 2013 Stamp set, and PK-195 Honey Sentiments for the "Hey Chickie" sentiment. I stamped the image with Memento Tuxedo Black ink, and colored this sweet chick with Copic markers. I took the flower from the stamp of the month set and fashioned it into a fetching little skirt if I do say so myself. Doesn't every little chickie need a skirt made of flower petals? I love how that plan came together!! The patterned paper is from my Basic Grey stash, and I finished this cutie off with some pearl flourish embellishments. Your next stop on this fabulous hop is at Melissa Haas's Blog. She is super creative and talented and I know she will have something WONDERFUL to share with you! Have fun and enjoy the hop! Below is the complete hop order just in case you happen to get lost along the way. Thanks for stopping by and happy hopping!!! Oh! Don't forget to leave comments for our ladies today, because there's a chance for you to win THIS amazing prize package just for hopping along with us and commenting on our designer's blogs! WOW!!! Here are the details! Aren't these adorable? They are a part of one of the recent releases at Peachy Keen Stamps. Drop by The Peachy Keen Stamps Store to see the complete collection of new stamps, and while you're there, be sure to check out our Peachy Pick of the Week! It's a GREAT DEAL and only available for a limited time, so get yours while you can!! All you need to do to be entered to win is leave a comment on each blog on this Spring Fling Blog Hop. We'll choose one random winner from all the comments to win the above prize package. We won't know until the time comes which blog will be awarding the prize, and you'll increase your chances of winning by leaving a comment on each blog. This hop will remain open for comments until 11:59 CDT on Sunday, April 28th, and the winner will be announced on the PKS Blog on Monday! OMGoodness Lorie! This card is superb! I LOVE LOVE LOVE how you made a tutu for the birdie with the flower! SO very clever! The little pearl accents and ribbon make this card cuter than ever! Beautiful job! Gorgeous!!! Love her little flower skirt!! So creative!! Beautiful work!! Ha!! I KNEW I was in for a treat when I came by and you haven't disappointed! This is absolutely brilliant. How clever to turn the daisy into a skirt for goodness sake! Ha Ha! Genius at work!!! Oh my goodness that little tutu style skirt is sooo cute! WOW!! I LOVE how you used the flower petals to make a skirt! So very clever!! TFS! Very cute--love the skirt you created! WOW WOW WOW Absolutely Stunning and your coloring of course is just Gorgeous. Love all the colors my friend. oh my goodness! !1 How adorable!!! Absolutely gorgeous, Lorie! You are clever and talented... BEYOND WORDS! LOVE YOU! :)Huge Hugs and tons of Love! Oh my Lorie, your card is absolutely darling!! I just love your birdie with a flower tutu..
What a fun little card!! This is soooo Adorable!! Love that you made the flower her skirt! Very creative! OH gosh!!!!! You never cease to blow me away, Miss Lorie!!!!! This is positively darling!!!!! LOVE the "flower skirt" on your sweet chick. She is adorable and so beatiful! Fancy outfit your chickie is wearing!! Great design. WOW! ♥ everything about this card!!! Girl, your creations are always on point. Love, Love, Love...that cute little tutu skirt is adorbs. Oh your little chickie in her flower petal skirt is so adorable!! Love the design and all the bling on your card!! So cute! Love how you used the flower as a skirt, very creative! OMG Lorie! This is gorgeous! I am so in awe of your stunning coloring and you did yet another amazing job with your PK stamps!! What a cute card. The ribbon skirt topper is fabulous! Awwwww so darn precious gosh you sure made a cute cute card. Golly gosh how talented are you!!!!! Ms Chick looks like she was born with the shirt. So cute. Love the card. hey chickie this is adorable!! Lorie your coloring is so wonderful! I love your skirted chickie! I actually tried that but couldn't get it to look right. I was trying to use the flower center as part of the dress. Great idea to use it the way you did. You are amazing! Love all the pearls too! So glad you were able to participate! Love seeing your creations! Too cute Lorie!!! Love all the bling! Your card is sooo cute. TFS chickie. wooo hoooo a real cutie!!! OMGeee! She is sooo cute! I just love how you made her little skirt with the flower and the ribbon! So fun!! This is the cutest card. Thank you for sharing with us. wow, love all the pearl flourishes and the cute skirt with the ribbon waist.